It's getting to that time of year again where we get our shorts and little tops out and eat as much ice cream as we possibly can. I am part of Tesco Orchard and that is where it Tesco give you vouchers for their own brand stuff to try out and just do little reviews on the Tesco Orchard website. One of them a few weeks ago was their own brand of ice cream. We normally buy their ice cream but as it was a trial thing I thought I'll try something new, so I picked up these two little babies. The first one is Salted Caramel; this one was for me because I love caramel flavoured things but haven't really tried a salted caramel thing yet and it seems to be all the rage at the moment. My honest view on this one is that I enjoyed it but it wasn't the greatest thing I've ever tasted. I would've probably preferred normal caramel and it can get very sickly after a while so you have to take your time eating it. But that's not too much of a hardship, it just means it will last longer. I have a bit of it every weekend after I've had my dinner and now need to buy a new ice cream as it's all gone. My mum had some of it with me last weekend and she absolutely loved it, she will be going to buy some from the shops herself next time she goes to Tesco. It just depends on you as a person and probably the mood you're in. Next up the Caffe Latte one. I picked this up for the hubby to try because he's into all his coffee sort of things and he absolutely loved it. I think it's all gone now - in fact it went in the first weekend. His friend also had some of it too and he loved it. I know that he has bought some for his house now to have with his family so this one has gone down very well. I didn't actually get to try this one myself so I have to take my husband's and his friend's word for it. I will be buying them again for a little treat for the family. 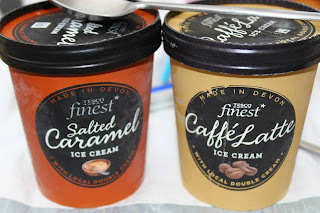 There were other flavours so instead of the Salted Caramel one I will probably get a different flavoured one to try out. I love ice-cream more than I really should. It's been so hard on my diet to not have it and now you've got me craving salted caramel ice-cream!